He stands with his black face covered, wearing a gray hoodie and holding a knife in his hand while two men, one stocky with almond brown skin and stubble on his face and head, stand facing him holding knives. They’re in a standoff. No one knows what will happen next. 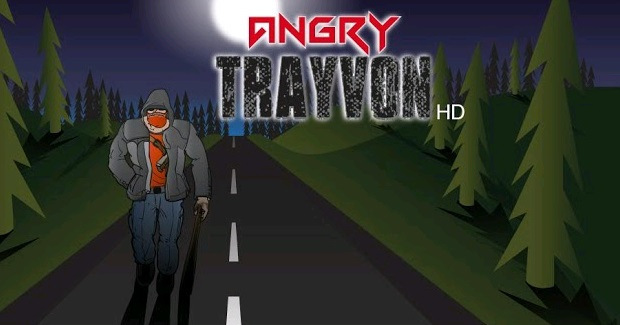 It’s up to players to decide who lives and who dies in the Angry Trayvon game. The visuals for the game and the name of the “protagonist” bear an eerie resemblance to George Zimmerman who is on trial for fatally shooting Trayvon Martin, 17, as he walked to his father’s home last February in Sanford, Fla.
Social media users found the coincidence tasteless and disrespectful and appealed to app stores to remove the game (here's a Storify of their tweets). News of the game spread through social media rapidly on Monday, the 20th day of the trial. The same day the unarmed teen’s father, Tracy Martin, testified. Trade Digital, the New York City-based game company that created the game, released a statement on their Facebook page late Monday saying the game had been removed from online app stores after complaints. But early Tuesday the Facebook version of the game was still enabled to add new users. Late Monday between 5,000 and 10,000 people downloaded the app from the Google Play shop before Google shut down the page. The Facebook apology was posted around 11 p.m. and said: "The people spoke out therefore this game was removed from the app stores. Sorry for the inconvenience as this was just an action game for entertainment. This was by no means a racist game. Nonetheless, it was removed as will this page and anything associated with the game will be removed." The game’s Facebook app page, created earlier this year, had 1,048 likes early today. It is very hard to believe that the developers of this game thought it was OK to use the details of what is perhaps the most high profile, racially-charged homicide of the decade as the premise for a violent video game. The game reduced Trayvon's 17 years of life and his murder to a backdrop of entertainment for couch potatoes. "Trayvon is angry and nobody can stop him from completing his world tour of revenge on the bad guys who terrorize cities everyday. 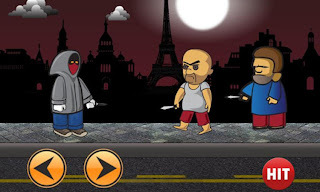 Use a variety of weapons to demolish Trayvon's attackers in various cities around the world. As you complete a level, you will notice more bad guys coming at Trayvon at a faster pace and a deadlier attack." The image of the black male as the brutal boogey man who will viciously annihilate unsuspecting victims without provocation or warning is an image that is pervasive in American media and is embedded in the American psyche. The pervasive presence of that dangerous stereotype may be why the Angry Trayvon developers thought it was OK to create such a game. But this game is a tasteless, callous way to not only recycle ugly stereotypes of black men but also to capitalize off this tragedy. Social media and new media have emerged to play an interesting role in this case in and outside of the courtroom. Last year social media activism pushed authorities to investigate Trayvon’s murder. Courtroom insiders are bringing us into the room by reporting the tone and feel of the proceedings through social media updates. But throughout the Zimmerman trial social networks have revealed some of the deep-rooted prejudices this nation still holds of people of color, including black women and Latinas. 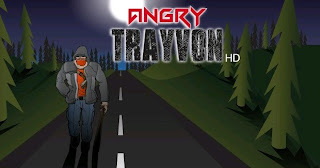 And this game that used Trayvon’s name and murder for entertainment reveals just how easy it is for some to dehumanize black boys in life and in death.